From September 17 to 21, 2014, 10 members of South Korea’s Gyeongsangnamdo Ramsar Environmental Foundation (GREF) and the Environmental Ecosystem Research Foundation (ERF) visited Kushiro. Led by GREF CEO Mr. Jae-Yun Ko, the delegation included officials from nature information facilities at Upo Wetland in South Gyeongsang Province (Gyeongsangnamdo) and elsewhere. The group toured nature conservation facilities and walking trails at Ramsar sites in the Kushiro region on a fine autumn day. 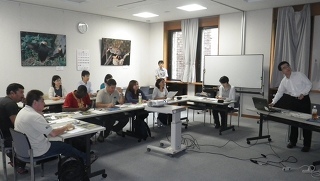 KIWC representatives accompanied the visitors on September 18 to Kushiro-shitsugen (Kushiro Wetland), showing them around the walking trail, the Lake Toro Eco-Museum Center and other nature conservation facilities. The group watched Red-crowned cranes while walking on the Onnenai Boardwalk and toured the Kushiro-shitsugen Wildlife Center where sick or wounded Steller’s sea eagles and other endangered raptors are treated. The wetland conservation professionals from South Korea appeared very interested in what they saw. On September 19, 17 participants at a joint workshop attended by the delegation and KIWC representatives at Kushiro City Hall shared information on the present status of wetland conservation in their respective regions and traded opinions. On behalf of the Japanese and South Korean organizations, Mr. Ko of GREF and KIWC Secretary General Mr. Yoshikatsu Kikuchi gave presentations on their activities and related challenges in the field. 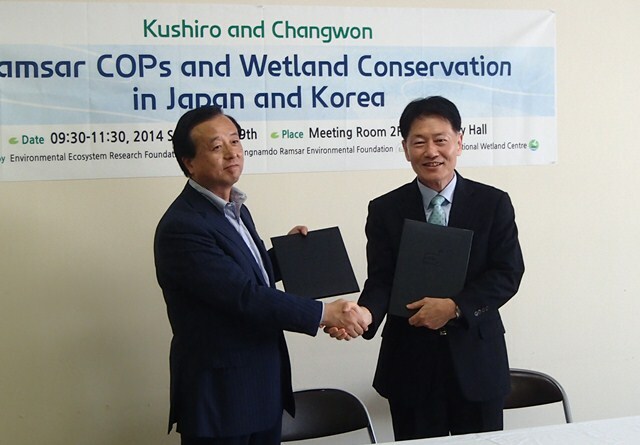 The commonalities seen between the two parties highlighted that enhanced collaboration involving GREF and KIWC would mutually benefit the organizations and also contribute significantly to wetland conservation in the Kushiro region and South Gyeongsang Province as a whole. Against this backdrop, representatives of GREF and KIWC signed a memorandum on future collaboration pledging to promote exchanges between them after the workshop. The delegation then toured Akkeshi-ko and Bekambeushi-shitsugen as well as Kiritappu-shitsugen before returning to Korea on September 21. 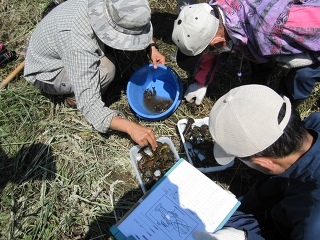 On September 6, 2014, a public participation survey was conducted on the environment of the Kushiro River, whose meander was restored in the Kayanuma District of Kushiro-shitsugen (Kushiro Wetland) in 2010. 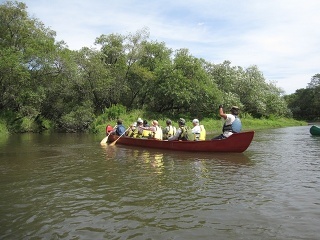 A total of 27 participants paddled 5.5 kilometers down the river in canoes from the restored old channel to the natural stream while observing riverside vegetation and landscapes, animals and plants, and other aspects of the river. The surveyors stopped at two sandbanks to examine their scales and geological formations and to check sediment trapped there since the restoration. After the survey, the participants shared their results and findings, summarized them by canoe group and developed a nature information map of the Kushiro River. The survey has been implemented annually since the meander restoration was completed. This was the 5th autumnal survey and the 10th including summer surveys. The surveyors (particularly regular participants) have become increasingly proactive over time, and on this occasion spearheaded all the work involved, from the sandbank survey to the presentation of results. Thanks to their contribution, the job of the staff becomes easier every year. During the survey, the participants took the lead in picking up litter on the sandbanks, showing their enhanced awareness of the need to conserve the wetland. On July 13, 2014, an environmental survey involving 19 locals was conducted in the Kayanuma District of Shibecha Town, where the meander of the Kushiro River was restored as part of the Kushiro Wetland Nature Restoration Project. This was the ninth annual survey since the meander restoration was completed in 2010, and was attended by 29 people. Participants were divided into three groups (an aquatic organism survey team, a sediment/soil survey team and a vegetation survey team) and conducted their surveys under the guidance of experts. The aquatic organism survey team caught fish and crustaceans, including signal crayfish (Pacifastacus leniusculus), using traps and spoon nets, and found seven species. The sediment/soil survey team investigated riverside geological formations and river sandbank scale to gauge the status of sedimentation and flooding in the restored channel. Meanwhile, the vegetation survey team investigated vegetation changes in four demarcated areas of the forest. After the survey, the participants assembled in a meeting room at a nearby spa facility to share their results and compare them with the past data. Part of the investigation was cancelled due to a rise in the river’s water level caused by the approach of the powerful Typhoon No. 8 immediately before the survey. However, the event provided valuable opportunities to witness the occurrence of flooding – a function of meandering rivers – as evidenced by river water puddles and muddy plants found in the riverside forest. The survey was implemented with river improvement funding provided by the River Foundation. 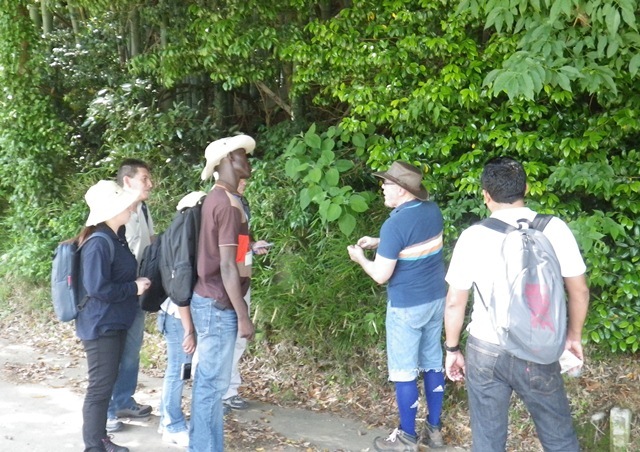 From May 26 to July 8, 2014, seven government administrative officials from Costa Rica, Mexico, Malaysia and Uganda came to Japan to learn about the conservation and sustainable use of biodiversity in wetland ecosystems. This training program was organized by the Japan International Cooperation Agency (JICA) in collaboration with Japan’s Ministry of the Environment, and was hosted by the Kushiro International Wetland Centre. This was the third such event. Traveling from Tokyo to Okinawa, Fujiyoshida, Miyagi and Hokkaido, the trainees learned about a variety of wetlands, including marshes, tidal flats, coral reefs, rivers and rice paddies. Specifically, they found out about activities conducted to conserve wetlands in these areas, initiatives to use them for industry and education, and other efforts. They had opportunities to talk directly with people engaging in conservation activities, local residents and government officials at Ramsar sites in local destinations including Manko (Okinawa), Kabukuri-numa and the surrounding rice paddies (Miyagi), Kushiro-shitsugen, Akkeshi-ko and Bekambeushi-shitsugen, and Kiritappu-shitsugen (Hokkaido). Through these interactions, the trainees learned about the background of decisions to implement conservation efforts as well as examples of community revitalization leveraging wetland characteristics (e.g., branding of agricultural and fishery products, related utilization for tourism, and environmental education). 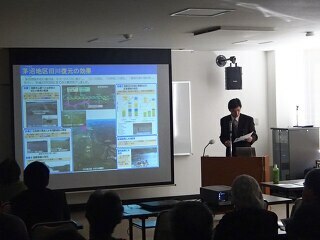 The training program included a field tour to the site of the Kushiro Wetland Nature Restoration Project with commentary provided by Hokkaido Shibecha High School students, joint exploration of Kiritappu-shitsugen with students from Hamanaka Town’s Chanai Elementary School, and a workshop at the Manko Waterbird and Wetland Center with officials from the Ministry of the Environment, the City of Naha and the City of Tomigusuku. In this way, the program of lectures, practical training and discussion was implemented in collaboration with a variety of parties involved in wetland management. Based on these experiences, the trainees drafted plans for biodiversity conservation and sustainable use in wetland ecosystems for later implementation in their own countries and presented their plans at the end of the program. A survey briefing session was held at the Kushiro Koryu Plaza Saiwai on February 20, 2014, to report on the results of surveys conducted over the four years from 2010. 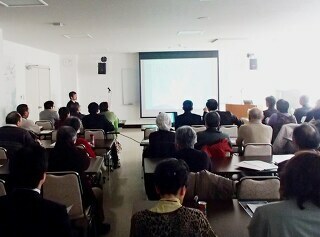 The event was attended by 50 people including previous survey participants. Mr. Yasuhiro Akiyama (Director of the Flood Control Division, Kushiro Development and Construction Department of the Ministry of Land, Infrastructure and Transport) used a video and slides to outline a restoration project for the Kushiro River in the Kayanuma area. His presentation was followed by a report from a KIWC Bureau official outlining local environmental surveys and their results. 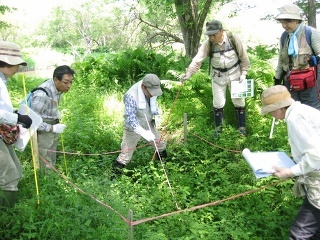 The experts who led the surveys also made comments highlighting changes in the topography of the Kushiro River’s banks and bed due to erosion and sedimentation that have occurred since the restoration of meandering sections, and indicated that that a desirable river environment for a variety of creatures were being formed. 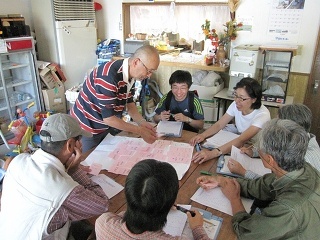 At the venue, facilitator Mr. Hisashi Shinsho and the experts present exchanged views with attendees, who gave their impressions on the research activities and provided suggestions for Signal Crayfish surveys.